Visual Arts as Medium of Confessionalization is the title of the RefoRC Summer School 2019. It will be held at the University of Wrocław in Poland, from July 22 to July 26, 2019. The Summer School is intended for M.A. and Ph.D.-students (of art history, history, theology, philosophy, literature, and related disciplines) who are interested in the visual culture and religious history of Early Modern Europe and affiliated to a Refo500 partner or RefoRC Member. The international Summer School Visual arts as medium of confessionalization, organized by the Department of Renaissance and Reformation Art at the University of Wrocław, is intended to explore a wide range of interrelationships and interdependencies between visual arts of all kinds, on the one hand, and religious identity in Early Modern Europe, on the other. The basis for our discussion is the paradigm of confessionalization as a notion introduced to historical studies (Wolfgang Reinhard and Heinz Schilling), however effectively applied and adapted to other disciplines of the humanities, among others art history. Starting from the assumption that confessional identity played an increasingly important role in nearly every possible aspect of European states and societies during and after the Reformations, the aim of our course is to examine the significance and role of visual arts within the processes of emergence, formation and evolution of diverse denominations in the Early Modern era. In general, our discussions will deal with a variety of issues relating to Lutheran, Reformed and Catholic confessionalization, and take into account examples of both homogeneous and multi-confessional territories and centers of the Reich and beyond its borders. While the ‘confessional identities’ era was not limited to the realms of theology, liturgy and devotion, but also interplayed with apparently secular domains, we will consider not only ecclesiastical and devotional art, but also various classes of objects related to everyday life of both individuals and social strata and groups. The place and the meaning of visual arts, as seen from that point of view, will be analyzed from diverse theoretical perspectives and methodological approaches. On the one hand, is the question of how works of art, i.e. analyzed in terms of their form, style, function, iconographic programs etc. reflected changes within the doctrine, organization, theology and worship of certain churches. On the other, art objects will be discussed as active factors that substantially influenced and contributed to those changes. Our goal is to examine to what extent and how confessional phenomena and their consequences interacted with various media, ranging from architecture and monumental sculpture, through paintings, graphical arts (both as book illustrations and polemical broadsheets), up to works of craftsmanship, medals, coins, etc. We are going to investigate patterns and strategies of mutual influences, i.e. how and in which ways the confessional issues interfered with other determinants, including vernacular traditions, as well as geographical, sociopolitical, and purely artistic ones. Among the key problems to analyze will be the following: 1) Theoretical attitudes of confessions toward a visual image; 2) “Visual manifestations” of confessions – using the example of the most eminent word-image compositions, displaying both the doctrine and rituals in ecclesiastical spaces; 3) Ecclesiastical buildings – their appearance, spatial disposition, interior arrangement, function, role and place in worship; 4) Church décor and furnishings between the poles of theology, liturgy and social decorum: objects related to liturgical rites (altarpieces, pulpits, baptismal fonts, confessionals and organ prospects), as well as decorations of galleries, benches, ceilings, vaults and walls; their symbolism, location, form and iconographic programs; 5) Endowments intended for personal and family memoria, i.e. sepulchral monuments, epitaphs as well as other objects related to funeral culture and post mortem commemoration; 6) Confessional identity versus secular architecture – public and private buildings and their decoration; 7) Confessional identity versus iconosphere of the secular milieu. Although the focus of our course is on questions of a historical and artistic nature, their subject matter remains, however, still relevant: it may be understood not solely as a part of European heritage, but also as a constitutive element of modern identities in their broadest sense. The participation in the Summer School is thought to provide competences and tools in the range of analysis of various mutual relations between visual arts and other spheres of culture in historical epochs. Our goal is not only to discuss problems theoretically, but first of all to study practically with concrete artworks along with relevant written sources. The place of the school, i.e. Wrocław as the capital of Silesia as a region with its complex history during the confessional era, delivers a great variety of examples of objects to follow in situ. Apart from artworks from city churches and museum collections, we are going to organize a study excursion to important historical towns of Silesia. The student has a deeper insight into the place and role of visual arts in the emergence and development of the Early Modern confessions. The student has a broadened view on how artistic phenomena contributed to the religious landscapes in Early Modern Europe. The student gains awareness on how, in specific artwork, confessional issues interplayed with other determinants (social, political, artistic etc.). The student will be able to use critical tools for analyzing artworks as instruments of religious identity and of interconfessional discourse. The student will be able to use visual material in the analysis of religious, political and social aspects of Early Modern confessionalization. The student strengthens his/her academic international network. Proficiency in spoken English and preferably some proficiency in understanding and reading German and Latin texts. The Summer School is open to M.A. students and Ph.D.-students of RefoRC Members and to a maximum of 5 participants affiliated with Refo500 partners. Preparatory material will be sent out two months in advance. The RefoRC Summer School is free for students affiliated with RefoRC Members. Participants belonging to Refo500 partners pay an extra fee of € 150.00. Lodging and travel costs will be paid by the participants. a single room: 91,80 PLN (ca. 22 EUR) per night. The rooms are reserved for the period July, 22-July, 26 or (optionally) July, 27. For participants who are interested to extend their stay: an additional (voluntary) one-day excursion will be organized on Saturday, July, 27th.Reservations can be made via the application form. Applications are welcome before April 30, 2019. Apply here. For more inquiry please contact: mwislocki@yahoo.com (Dr. Marcin Wisłocki, University of Wroclaw, Institute of Art History, Szewska 36, PL-50-139 Wrocław). 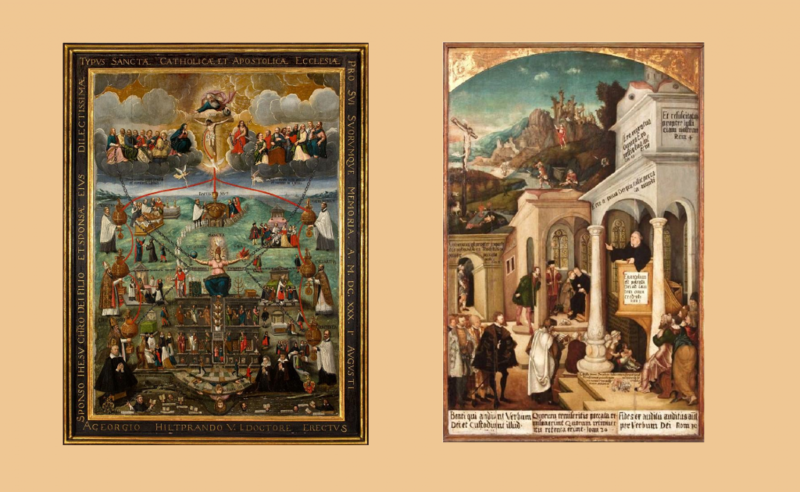 Visual: artworks from Silesia, testimoning the Catholic and Lutheran confessionalization.